Welcome to our new release finale at The Craft's Meow! It's our tradition to have a blog hop showcasing all 4 new releases for this month! You should have arrived from our Guest Designer Kim Duran's blog. Here's my card, using 2 of the new sets. You can now view and purchase the new November sets at The Craft's Meow Store! Your next stop is at Lindsay's blog. Don't forget to leave a comment at each stop, because we're giving away all FOUR new sets to one lucky person! You'll have until 9 PM Sunday, Dec.2 to leave a comment at each blog to be eligible for the prize. If you happen to get lost along the way, just go to The Craft's Meow Blog for a list of all the blogs participating. If you're here to see my card for the preview of The Craft's Meow stamps for today, please click HERE or scroll down one post - thanks! I found a challenge at the Stampendous Blog which asks us to pair one of their products with a Core'dinations product. I just got this beautiful Stampendous cling called Snowy Postcard and couldn't wait to play with it. So I stamped it on a kraft card base, and again on an aqua Core'dinations kraft-core paper. Then I used a picket fence distress marker to lighten the roofs and ground on the aqua panel, cut out the inner circle, colored the holly leaves, and glued it to the kraft card. The card front was embossed with a Darice snowflake folder, and then I lightly sanded the Core'dinations paper to bring out the snowflakes in kraft, and added some pearls as berries on the holly. I like how this turned out, especially the combination of the kraft and aqua with touches of red! Welcome back to our final preview of another new stamp set release at The Craft's Meow Store! This is another set by Karen Baker called Zoom Goes My Heart and it's packed with automotive motifs and sentiments that will be sure to please the men in our lives when we make them a card for Valentine's Day or any other occasion! Here's my card using just a few of the elements in this really large set. I first used a mask and some spray to make my background circular design, then stamped the speedometer in the center, and added 2 of the sentiments from the set, roughed up the edges of my panel, added a gem heart, and attached it to a red card. Please visit The Craft's Meow to see my teamies' takes on this unique set, and leave a comment by 9 PM PST tonight to have a chance to win this new Zoom Goes My Heart set! And please come back tomorrow for the full reveal of all 4 new sets for our November release, along with a blog hop showcasing them (and a chance to win ALL FOUR new sets)! If you're here to see The Craft's Meow newest release for today, please click HERE. Good morning, all! I trust that all is going well in your corner of the world. It's time for another challenge at the Simon Says Stamp challenge blog! This first one uses some pearls and buttons and the tapes run horizontally. On this one, I went a little wild with my tapes and covered practically the whole card. I also used another Martha product (a gift from my friend Joy) called Doily Lace Cherish Labels. They are embossed and are sticky, so I just stamped my sentiment and added it to the card. And for my final card, my tapes run vertically. I embossed the whole card, tapes and all with a Cuttlebug Houndstooth folder, and used another of the Cherish Labels. 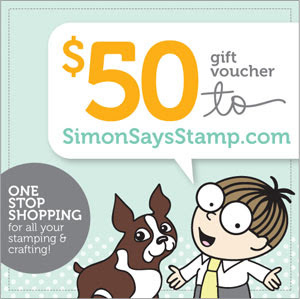 As always, there's a $50.00 gift voucher to the Simon Says Stamp Store up for grabs again this week! Ready, get set, GO! Welcome back! It's day 3 of The Craft's Meow November stamp previews! I couldn't help myself; with that quilt, I just had to go "country" with this one! The shelf was stamped on some woodgrain paper, and the darling little quilt was colored up in peaches, greens, and country blues. Both were cut out and added on top of my country wallpaper, and I used a sentiment from the original Stitched Sentiments set to make what I hope looks like wood letter blocks to stand on the top of the shelf. Please go on over to The Craft's Meow blog to see what the other Design Team members did today - I promise you'll be wowed! If you leave a comment there by 9 PM PST this evening, you'll have a chance to win this new Beautiful Shelf set! We have 1 more set to introduce tomorrow, and then all of the new stamps will be ready to purchase on Friday after our traditional blog hop - see you then! Hello again, and welcome to the 2nd day of our November release of The Craft's Meow stamps! Today our stamp set is called Stitched Sentiments Two, and it's exactly what it says, a second set of stitched sentiments, designed by Nina B! For my first card, I used a flower and some leaves from the Stitched Flowers set, also by Nina, and paper-pieced them with papers from doodlebug design's Sugar & Spice collection. I embossed my card base with a little flower folder by Sizzix. 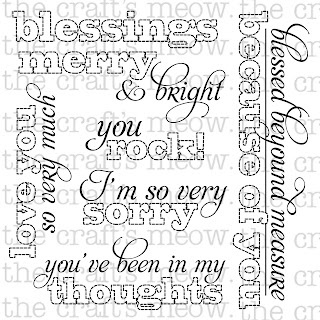 My sentiment is just one from the new set which includes 6 other sentiments. This one uses papers from Basic Grey's Aspen Frost collection, a Nesties Labels 20 die, some glittered snowflakes and a red pearl - really quick card to make! 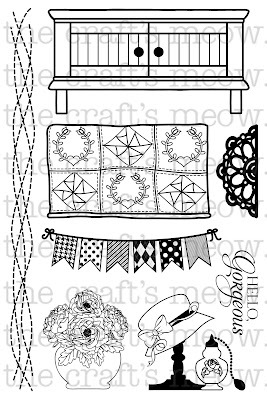 I hope you'll visit The Craft's Meow Blog today and the rest of the week to see lots of ideas from the Design Team using this new set, plus 3 others. While you're there, don't forget to leave a comment by 9 PM PST to win this new Stitched Sentiments 2 set!! See you tomorrow for another preview! Welcome to the first day of The Craft's Meow November release! Today we are previewing an adorable set by Mabelle R-O called Valentine Wishes. I made 2 cards for you today, one fairly CAS and the other packed with layers. Both of them are paper-pieced. I used papers mostly from Doodlebug Designs Hello Spring paper pad to paper-piece this little cutie. And for this 2nd card, the papers are mostly from their Sweet Cakes collection. Aren't these little girls darling? All of the stamps on both my cards are included in this set. Be sure to stop over at The Craft's Meow blog to see what my team-mates did today! While you're there, don't forget to leave a comment by 9 PM PST this evening to win Valentine Wishes! And then I hope you'll join me tomorrow and the rest of this week to see 3 other new sets! Hi everyone! I trust you had a lovely Thanksgiving holiday. We spent it with my parents and sister in SW Pennsylvania, and as we woke up this morning to come back home, we had our first snow of the season! Beautiful and serene, and so when I came home and was looking at the challenges I wanted to enter this week, a snowflake theme popped right into my head. Pop over to the CASE Study blog and look at Angeline's other card for this week and the work of the Design Team there - there are some really beautiful cards! A Sketch Challenge from Dawny! It's Wednesday! That means another challenge at the Simon Says Stamp challenge blog! I used their stamp called Snowman with Gift, and some papers from Echo Park's Christmas This & That pad. I colored the cute guy with alcohol markers, and then added some red snowflakes and green pearls, along with some candy-cane We R Memory Keepers baker's twine and a red button. I love having a sketch to follow! Once again, Heidi has provided a $50.00 gift voucher to the Simon Says Stamp store for a lucky random winner - will you be the one this week! Can't wait to see what you do! Happy Thanksgiving to all my American friends - don't eat too much of that turkey! I told you last week about the 24 Hour Scramble that the ladies at the Hero Arts flickr group launched.....we had 24 hours of 90-minute challenges, each one hosted by a different member, with a different theme each time. A scramble, if you don't know, is making a card to the specifications of the Hostess, photographing it, and uploading it to the flickr group, all in 90 minutes. I was able to participate in 7 of the 12 Scrambles, and I'd like to share the cards I made today. I also challenged myself to make only Christmas cards for each challenge. So here we go! Lucille's Challenge #9 was "An Animal of a Different Color"; I made an orange deer and a peacock (distress ink) tree! Karen was our hostess for Challenge #10, and her rules were to use ONLY red, cream, and gold. This one gave me fits, because the red music didn't dry enough by the time I overstamped the pine flourish background; when I embossed it in gold, the music took it, too, so there isn't as much of a contrast in the background as I'd wished for, but time was running out! And for the final Challenge #12, Janet chose the theme of "Time"; we could interpret that any way we wished. She had given us an example card which used a stamped clock over a printed paper, and that's the direction I went also. If you want specifics about any of these cards, please go HERE, where you can click on the card you're interested in to see the supplies I used to make it. And if you'd like to see other cards in each challenge, just click on the Challenge you're interested in up above. I want to give special thanks to Hannah, one of our youngest members, who organized the whole event. She pulled this whole thing together quickly, and then was there throughout the whole process, to answer questions and keep us all on track and updated. Bravo, Hannah! Here is my card for this week's CAS-ual Fridays "Winter Blues" challenge. I used my favorite sketch from a Hero Arts contest several months ago, stamping my own panel with music, text, and various snowflakes, mimicing a favorite printed paper from Hobby Lobby . The snowflake dies are from Spellbinders, I think, on loan from my friend Yvonne. I've posted about these before - a scramble is a challenge that we do about every 2 weeks over at the Hero Arts Flickr site - we have a hostess, who chooses a challenge for us and posts it there. Then we have 90 minutes to make a card, photograph it, and upload it to the flickr site. The only given is that you have to use at least ONE Hero Arts stamp. Here are 2 cards I made for our 52nd scramble hosted by Kathy. Her challenge was a simple one, to use a background stamp and a border punch (someone who didn't have a border punch used decorative scissors). I haven't played with this stamp/emboss set nearly enough, so for the 2nd card, I embossed the triangle shapes first on kraft core cardstock, then sanded them to bring out the kraft, and THEN stamped the big background stamp that matches it. (the usual way to use these sets is the other way around: stamp, then emboss). As you can see, it didn't turn out perfect, but I do like the effect I got with the addition of sanding. If you would like to join us this weekend for the Grandaddy of all Scrambles, our Hannah has organized a 24 hour Scramble, which will begin at the Hero Arts flickr site this evening (Friday, November 16) at 7:30 PM Eastern Standard Time (6:30 PM Central Standard Time). She has lined up 12 hostesses every 2 hours, each with a new and different challenge, and they will continue through the night and into Saturday, November 17. Here is the information. If you are unfamiliar with Hero Arts flickr, you need to become a member first before uploading your card, and the hostess will always have a tag on her challenge that you will tag your card with. This weekend it is "24hourscramble1", and make sure you choose the Hero Arts gallery as a group, so that everyone can see your creation. I haven't played for a long time at the Flourishes Blog. I love their stamps because of the variety of beautiful flowers they produce. This week they have a really interesting challenge, a Progressive one - what a great idea! It starts with a sketch, then adds 3 more steps: make it monochromatic, use some decorative paper, and add bling! You can make 4 separate cards, or just 1, using all of the steps. I chose to do the latter, using one of my favorite flowers from a set called Botanical Bookplates, volume 2. The sentiment is also from the same set, and since its subject is hope, I went pink, thinking this would make a lovely card to send to a breast cancer patient. Happy Wednesday, everyone! It's time again for another Simon Says Stamp challenge! This week we're asking you to make us some Thanksgiving or Thank You creations. I really love these papers from Simple Stories Harvest Lane collection, especially the one I used for my background here - doesn't it make you think of a cozy quilt? There are so many wonderful colors in it, it was easy to pull other papers from the same pad to make my banners. The sentiment is from Hero Arts A Season of Giving; it was stamped on a circle, then framed up with a Die-Namics Decorative Doily die. The button is from October Afternoon's 9 to 5 button collection - I have used these all fall, and still have lots left! Don't forget to visit our blog to see what Guest Designer Barb and the rest of my teamies made for you this week! Heidi has generously provided another $50.00 gift voucher to the Simon Says Stamp Store for a random winner. I used 2 of my favorite non-holiday stamps for this card, then added a Christmas sentiment. It seemed too small for the space, so I wanted gold pearls below it. I dipped white ones into a VersaMark pad, then into the gold embossing powder and heated......worked pretty well! 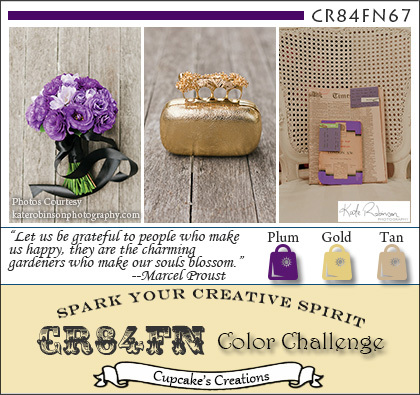 Congratulations to the new ladies on the Design Team at CR84FN - you join an elite group! Looking forward to seeing your work! Good morning! Welcome to The Craft's Meow blog hop! We're going to be using our Christmas and Winter sets this time; here's a great way to get some ideas for your Christmas cards! Please visit all of the stops and then make a comment at The Craft's Meow Blog to win a stamp set of your choice! You'll have until Wednesday, November 14, at 9:00 PM PDT to enter. You should have arrived here from the amazing Karen's blog; don't you adore the card she made for today? I made 2 cards today, both using my Brilliance Peacock ink pad - I think these colors are fun and fresh for Christmas, and definitely lend themselves to snowflakes! I've used this design before, but with washi tapes. I thought it would be fun to use 3 of the elements from the set as my vertical elements. After stamping them and the sentiment, I embossed the whole card front with snowflakes, and then added an embellished snowflake to finish. And for this one, I chose just the candy cane stripe. I masked off half of my panel diagonally, and stamped it repeatedly, then reversed the mask and stamped it again at a 90 degree angle from the first stamping. Then I just added my sentiment and a big snowflake die, and placed my panel on a white card. Okay, time to move on to visit Lindsay's blog; you'll love what she's done today! After you're finished the hop, don't forget to leave a comment at The Craft's Meow - you could win a stamp set of your choice! Also, Lisa has put all of the Holiday stamp sets on sale at 15% off through Thursday, November 15 - just use the code Holiday at checkout! !